Leather upper with strap and hardware detail. Full rubber outsole with welt and Grand.ØS technology for comfort and stability. 45mm | 1.7 inch stacked heel. These booties are great, they are adorable style (I get so many compliments) and high quality leather which is not each to come by these days. The only complaint I have is they are a little smaller than normal size. The leather wears in quickly so with thin socks they fit comfortably after about 7 days of wear - but those 7 days were a little numb for my toes and I still cannot wear thick socks without feeling tight. I tend to run between 8-8.5, I ordered the 8.5 but I would recommend 1/2 size up for everyone. For those that ordered they’re normal size and cannot return due to final sale, give it some time you can make it work! I love the style, height BUT 6.5 M is tight for me... The size are way too small as describe.. I feel bad I cannot returned if final sales..
Bought this pair to replace a similar pair I purchased several years ago. Great style and fit. I have a narrow foot, but was only able to order a medium width. With the addition of a wool sock they fit well. I’m looking forward to wearing them next winter. Shoe is well made, beautiful leather and stacked heel. Gives me some added height without compromising comfort. I have some foot issues and I can wear these booties for many hours and they remain comfortable. Beautiful shoes. There is heel but feels super comfortable. The price and favorable reviews. Love Cole Hann boots! They fit my foot well and are stylish and comfortable. 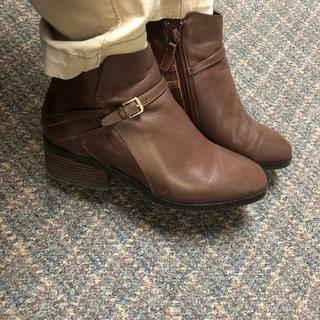 I chose this boot because it is a medium brown that will go well with several purses i have and the mid height heel will be comfortable all day. Prayed for these boots to go on sale! They go perfectly with a leather jacket I bought from Chicos! They are the perfect heel size for comfort and style and the color is classic! I like this one for everyday us! I like the style and the brand! Because of the amazing sale price. Needed new brown shoes with low heel, suitable for work and play. These look great. Hope they are comfortable as well. These will replace my Cole haan's from 20 years ago. Good style. Leather looks first rate. Is B a narrow width? Do these have a side zipper? BEST ANSWER: Yes, they do! And they are very comfortable. I wear mine a lot! BEST ANSWER: These were true to size for me. Bought my normal size 8 and they fit great. I wear a size 5. usually all size 5's fit me but this boot ran a bit big. Yes! I wear a 9.5 and the boot fits beautifully. Mine were true to size. is this real leather or synthetic material ?